Coming less than a week after a terribly mishandled bullying case which destroyed my five year career in scouting, I guess I had unrealistically high expectations for this book. While it didn't measure up to my expectations, it was nevertheless a useful and practical booklet covering the subject of Internet predators and scams. There's a mention of autism but really, it's something that can be summed up in one or two sentences. People with autism spend a lot of time online, they are naive and are easily baited. I really wasn't happy with the bullying section of this book. The section didn't start with a definition of bullying but described cyber-bullying thus; "Cyber Bullying is a term typically used to describe emotional victimisation and abuse among school and college aged individuals". This is a terrible description which makes it seem that cyber-bullying stops when people leave college. The remainder of the chapter assumes that the bully is a school student and that the school is supportive of the victim". I can tell you from recent experience that in real life, this is certainly not the case. The second section covers online predators and this was much better. Strangely enough, there were three pages which were copied pretty much verbatim from the previous section. They fitted into the subject material but in a book of under 100 pages, this just felt a little wasteful. Once the book reaches the scams though, it picks up considerably and gives a great deal of good practical advice while covering the major types of scam. This section is the real gold and it stops concentrating on kids and recognises that adults with money are generally the main target of scams. There's also a chapter by Jennifer McIlwee Myers called "an insider's view". I was expecting this to be about Asperger's syndrome but instead it's about sites which help you to identify scams. It's still a great chapter, it's just not about Autism - except perhaps for one or two lines. No More Victims is a great book if you need to know about scams and predators but not so useful for bullying. Despite its title, it doesn't bring anything about Autism to the table but it is nevertheless a useful book for adults on the spectrum who are clearly more at risk due to their naivety and the number of hours they spend on the Internet. I'm not sure that including autism on the cover is doing the book any favours though and it's equally useful to all adults who "compute" regularly. At under 100 pages, this book is a breeze to read and it's very well laid out with clear headings, points and pictures. The appendix contains two sample "contract forms" that parents can use with their kids covering bullying and the use of phone and Internet. If you've ever unknowingly believed and forwarded a fake message on Facebook, then this book is for you. 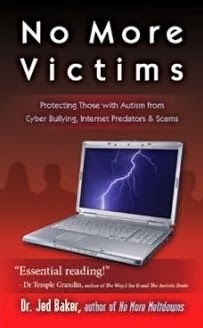 No More Victims: Protecting those with Autism from Cyber Bullying, Internet Predators and Scams by Dr Jed Baker is available from Future Horizons Inc. and Amazon. Honesty Disclaimer; I was provided with a copy of this book free of charge for review purposes. I've always been bullied off-line. And I get it all the time from people in the Oswestry area. I've been called all sorts of weird crap words. Harmful to those of us that are very sensitive to too much neurotypical behaviour. Even The British Police don't help us at all. Oswestry is a very dull community. Too much high unemployment going on around here. I'd love to know who I could report the local authorities/establishments to. Anybody got any good tips for me?